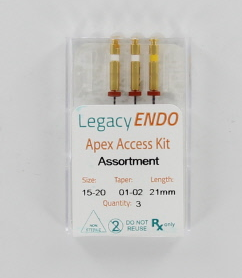 LegacyENDO Apex Access kit assortiment Lengte 25 mm. The LegacyENDO Apex Access files are specifically designed to prepare the best glidepath in every root canal. Following up to three files (the Access 1, 2 & 3) the LegacyENDO Apex Access files let you start any root canal treatment with confidence. The LegacyENDO Apex Access 2 and 3 have been manufactured with the Controlled Memory Technology. This increases strength and flexibility, resulting in up to 800% greater resistance to cyclic fatigue stresses. The technology allows natural canal tracking and files can be pre-bent if needed.